Want to connect with Enrica? Greetings from a dedicated Caregiver seeking a good family for a long term employment! My name is Enrica, 28 years old, from Philippines and currently working here in Israel as a live-in caregiver. I am the second child ( of 3 children) and the only daughter in the family. My parents are very awesome and hardworking people whom I will always be proud of. Thru farming and a small business in the market, they were able to brought us up, sent us to school and have given us everything of their best. Fortunately, I was able to get a course in college and finished it. I took up a Bachelor Degree in Nursing and graduated on April 2007. I took my Nursing Licensure Exam, December of the same year and became a Registered Nurse on January 2008. My Nursing Profession started with me being a Volunteer Nurse (Unpaid Nurse) in a community hospital in our town. During my service, I was exposed in different wards particularly, OB & Pediatric Ward and was able to interact with people of different age and health conditions. At the same time, I was given a chance to become a Reliever Nurse in some clinics near the city. I took it as a part time job in order to support my needs while waiting to get employ in the hospital where I rendered my service. Being a Nurse, my heart will always be into taking care of people, not only because it is my profession but because this became already my passion. My nursing service continue for a year and half. After that, I was able to work in a Pharmaceutical Company as a Medical Representative, it lasted for 9 months and the opportunity to work in Israel came. October 2010, when I first arrived in Israel and work as a live in caregiver. My first employer was a disabled “quadreplegic” woman. She was a very nice and awesome lady who treated me very fairly and like her own family. We had a very good relationship with each other that even after my employment with her, we stayed as friends and kept in touch. My job with her were: To provide a total personal care (e.g. bathing, dressing, grooming, and toileting); Assisting her in daily living activities including hydro & physio therapy; Administering medicines and escorting in Doctor’s appointments; I also performed catheterization on her due to her inability to control her bladder. And because of her health condition that requires me to lift, I learned the proper body mechanics in moving her from wheelchair to bed and vice versa. As a live in caregiver, I was also the one responsible in taking care of the house, making it clean, organized and always accessible for her. It also includes: making beds, doing the laundry, making grocery list and other household chores. My work with her lasted for 2years and 3mos. After my employment with her, I was able to work to an elderly with Alzheimer. With this woman, I was able to enhance my Hebrew speaking and learned a bit of French since she only spoke to me in those two languanges. I also learned how to cook some of Israeli & Tunisian foods because one of my activity with her was to cook and bake during “shabbath” (A Jewish weekend holiday). I work with her for a year until the family decided to take her in an institution for elderly due to her worsening condition that makes it unmanageable anymore. And as of now, I am on my third employer. A very kind and good hearted woman on her 90’s and at the beginner stage of Dementia. My priority responsibility with her is to be her companion since she is forgetting, confused and depressed. Assisting her in daily living activities including, bathing, dressing and grooming. Everyday, I always encourage her to take a walk with me for atleast 30 mins and doing her some light massage to help her maintain mobility. And since we are living in a nursing home wherein they provide a lot of activities for elders, I motivate her to attend activities that will enable her to function cognitively such as knitting & crochet, some memory drills and watching concerts & lessons. I also provide her newspapers & magazines to read, some word & number games and let her watched tv to keep her oriented in current events. As a caregiver overseas, my job has cause me a lot of improvement as a health care provider. I learned to understand and appreciate people more, from the culture and beliefs that is different of mine to the personality and lifestyle of each and every person that I’ve encountered and took care of. Considering the nature of the job that requires a lot of patience ( physically, mentally, emotionally and spiritually), this made me a responsible and dependable caregiver. As per children experience, I wasn’t able to take care of children other than my younger brother (since we have a 14 years gap) and my nephew who lived with us since infant up to 5 years old but I am very much willing to take care of kids if I will be given a chance. My experience in pediatric during my nursing service is one of my advantage and as someone who studied proper approach to people of different ages, I desire to apply my knowledge in managing and taking care of kids. I am a cheerful, friendly type of personality. I love to sing and read books specially my bible. I am a very spiritual kind of person and I am a proud Christian. It is my dream since I was a kid to be in the land of maples. As I grow older, opportunity comes that makes me pursue this childhood dream and now that we have given an opportunity to work in Canada under the Live-in Caregiver Program, I can’t wait to finally get there and live in the land of my dream. 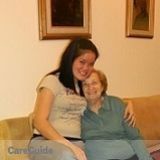 I wish to find a good family who is in need of help of a caregiver like me and start working for a long term employment. If u wish to know more about me, please don’t hesitate to write me. Thank you and a blessed day! pick up to and from school, tutoring and assisting in their home works.